Diana Wynne Jones is one of my hands-down favorite writers. Her books are consistently surprising, creative, intelligent, compassionate, and often very, very funny. I read this one when it was first published, but there is a sequel called Year of the Griffin that I've never read, and as I'm always delighted to have an excuse to reread one of her books, I brought this one home from the library to refresh my memory. And what a rollicking good time I had! This book was written after her hilarious "nonfiction" book The Tough Guide to Fantasyland, which is a must-read for all lovers of high fantasy. It is written in the form of a guidebook, as though the reader were about to embark on a journey to a fantasy world, informing readers of such useful things as how to escape from goblins, the difference between an Amulet and a Talisman, and why high priests are always evil. It takes on all the stereotypes and cliches of fantasy fiction in an affectionate, hilarious way. At any rate, this novel presents us with the actual fantasy world that a tourist might be visiting. And this fantasy world has had it with tourists! The premise is that Mr. Chesney, an incredibly rich and powerful (as in has-a-demon-to-do-his-bidding powerful) businessman from another world has set up a tourist industry on a planet that has magic. The inhabitants of the planet are fed up with the annual "pilgrim parties" of tourists who traipse through their world. Mr. Chesney has insisted they all play parts for the pilgrims, so every year one of the wizards has to be the Dark Lord and set up a creepy dark fortress, and there are battles to be fought (trampling the crops, of course), magical objects to be discovered, evil minions to "fight," and so on. Desperate to change the situation, the High Chancellor consults the oracles. She is told that the first person she sees must be this year's Dark Lord. Unfortunately for the Wizard Derk, who would like nothing more than to putter about his peaceful domain, creating amazing magical animals such as griffins, flying pigs and winged horses, he is that person. Although no one tells him what the oracles have said. He is given a handbook on his responsibilities as Dark Lord that has instructions like "The Dark Lord's citadel must always be a black castle with a labyrinthine interior lit by baleful fire." Unfortunately, everything starts going wrong at once - and when Derk becomes wounded and is unable to continue with preparations, his family - including his griffin children - must step in to help out. Aside from the constantly humorous inversion of fantasy stereotypes, the novel also tells an engaging and heartfelt story about family. It is a very complex novel, though, with an enormous cast of characters and a great many things happening at one, with much for a reader to keep track of as the plot unfolds. Although my library shelves this book in the teen section, I would say that it is equally appealing to adults, and perhaps even more appropriate for older readers - not because of any potentially objectionable content, but because it is so very complicated. I also find that it is easier to get teens to read books from the adult section than it is to get adults to read books from the YA shelves, and I'd hate for anyone to miss out on this funny, intelligent tale. The Emir was flatly refusing to be the puppet king the lists said he should be. "I'll be anything else you choose," he told Derk, "but I will not have my mind enslaved to this tiara. I have seen Sheik Detroy. He is still walking like a zombie after last year. He drools. His valet has to feed him. It's disgusting! These magic objects are not safe." Derk had seen Sheik Detroy, too. He felt the Emir had a point. "Then could you perhaps get one of your most devoted servants to wear the tiara for you?" "And have him usurp my throne?" the Emir said. "I hope you joke." They argued for several hours. At length Derk said desperately, "Well, can't you wear a copy of the tiara and act being enslaved to it?" "What a good idea!" said the Emir. "I rather fancy myself as an actor. Very well." Fyrefly's Book Blog: "I was also surprised with the depth of the story: hiding underneath the satire is actually a family story with a fair bit of heart." Jenny's Books: "So it’s equal parts funny (because of all the tropes that the tourists (us, in a way) expect to see, and that the people have to work incredibly hard to give the tourists), and distressing, because here they all are, destroying their entire world year after year." You've not read Year of the Griffin? It's completely charming - Elda, the youngest griffin, goes off to school and makes all sorts of friends. I wouldn't have said it's my favorite of DWJ's books, but I think it is the one I go back to most often. I love it when writers can tell a story a little differently and treat a genre in a new way. I do have a confession though, I have not read Wynne Jones (ducks). But I have seen the Miyazaki anime of Howl's Moving Castle which I really enjoyed. I definitely hope to read her work in the future. Jenny - Can you believe it? I don't know how it escaped my notice (although it came out around the time my daughter was born, so I may have been a bit distracted at the time, LOL). I love Elda and am looking forward to reading it! Mariel - You are in for such a treat! for me DWJ is a bit like Terry Pratchett - even when a particular book isn't my favorite, it's still always a rewarding read. I hope you'll have time to try one of her books soon! This is the only of DWJ's books that I've read-read, although I've listened to two others. They actually (and sadly) don't work well in audiobook (for me, at least), because there's so much going on all the time that if I get distracted for ten seconds I wind up totally lost. More of her books are definitely on my list, though - starting with the sequel! 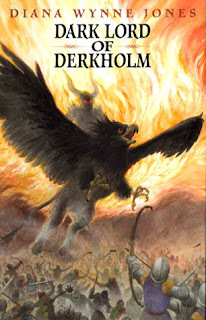 I started reading The Dark Lord of Derkholm a year or so ago, but it never caught my attention, so I ended up returning it to the library barely having read a word of it. I might try it out again one of these days, though! I've never heard of The Tough Guide to Fantasyland, but I love stuff like that. On to the "to be read" list it goes! I want that censorship button you had posted with the post. Love the cover artwork. Lol! This sounds like a great book! Fyrefly - I can see how it would be challenging to listen to one of her books. I often find myself having to flip back to previous parts to check on things, and that is really hard to do with audio! Allegra - Timing is so important, isn't it? I'll be curious to hear what you think of The Tough Guide if you read it. Virginia Gal - I'd like that button, too. I'd wear it at work!